Former heavyweight boxing champion Muhammad Ali addresses a gathering at a Nation of Islam convention, February 25, 1968, in Chicago. Seated behind Ali is the Honorable Elijah Muhammad, leader of the Nation of Islam. WASHINGTON (FinalCall.com) - History now remembers Muhammad Ali, the living legend, with honor. Mr. Ali celebrated his 65th birth anniversary Jan. 17 at Arizona State University. The iconic former heavyweight champion joined comedian Billy Crystal on stage and received a minute-long standing ovation from the crowd. Today, Mr. Ali is much beloved. His birth anniversary was the occasion for the announcement of a Muhammad Ali snack-food line. The snacks include fruit crumbles, crunchy mixes and flavored crisps and are given boxing-related names such as Rumble, Shuffle and Jabs. The flavors include “Fruit Fight,” “Thrill-A-Dill-A” and “Slammin’ Salsa.” They are shaped like boxing paraphernalia, and they went on sale at Georgia Tech, Texas A&M, the University of Pennsylvania, Ohio State and Yale Universities. 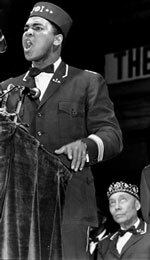 But there was a time when race-haters, segregationists and Muslim-haters, conspired to stymie the career and popularity of Heavyweight Boxing Champion Muhammad Ali, the “Greatest of all Time.” Mr. Ali was able to persevere not only because he was guided personally by the Most Honorable Elijah Muhammad, but because he was a “citizen” of the Nation of Islam in Chicago, and he was a member of the Fruit of Islam (F.O.I.). 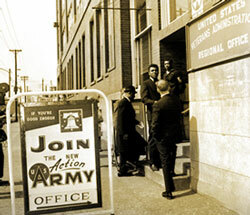 Heavyweight boxing champ Muhammad Ali paused on the step and greeted a friend, March 17, 1966, as he arrived at the Veterans building to appeal his 1A draft classification. Behind him, wearing a dark coat and hat, is his attorney, Edward Jocko of New York. His Selective Service medical records were re-opened. Although he had been disqualified, “4-F” Mr. Ali was re-classified “1-A”–draft-eligible–by officials angry at him for becoming a Muslim. “The Viet Cong never called me a n----r,” he said, declaring that he was a conscientious objector and that he would not serve in the U.S. military. In December 1974, Mr. Ali was a distinguished member of a Nation of Islam delegation on a month-long tour of Jamaica. The delegation was led by Min. James Muhammad, the younger brother of the Hon. Elijah Muhammad, which included the Hon. Min. Louis Farrakhan and other N.O.I. officials, all of whom were guests of Jamaican Prime Minister Michael Manley. Now, fighting the effects of advanced Parkinson’s Disease, Mr. Ali continues to receive international recognition, even from those who scorned him when he first became a Muslim. Muhammad Ali was chosen “Sportsman of the Century” by Sports Illustrated. He was named “Fighter of the Year” by Ring magazine, more times than any other athlete. In 2005, he was awarded the Presidential Medal of Freedom.